315 East 10th Street. Image: Mary Gillen. Building owner in district obtained permit to build rooftop addition prior to Landmarks approval. On January 17, 2012, Landmarks held a public hearing on, and later designated, the East 10th Street Historic District in Manhattan’s East Village. The district encompasses a row of 26 buildings from 293 to 345 East 10th Street between Avenues A and B. Many of the buildings were built speculatively to attract wealthy residents after the opening of Tompkins Square Park in 1834. In the late 19th and early 20th centuries, to accommodate a growing working-class immigrant community, many of the buildings were converted into multi-family apartment buildings and the block’s vacant lots were developed with tenement buildings. Landmarks calendared the district in June 2011. 8 CityLand 91 (July 15, 2011). 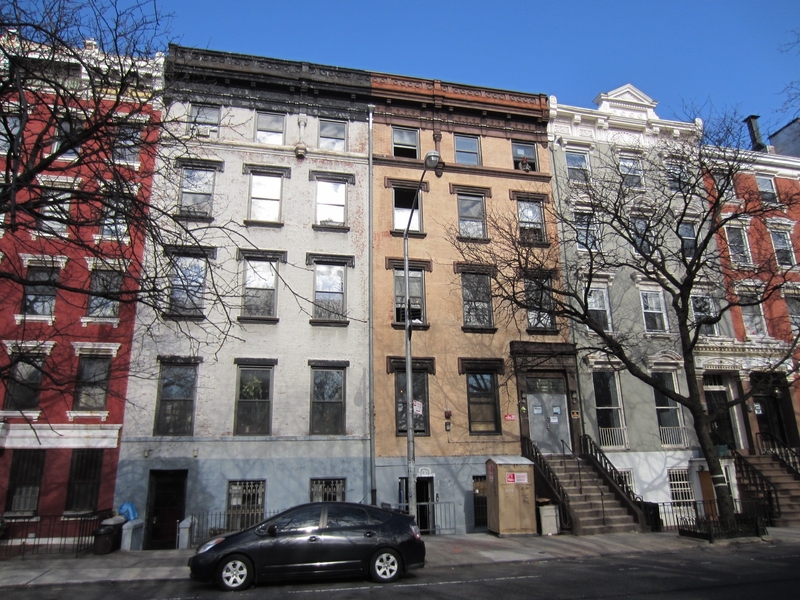 On November 28, 2011, Ben Shaoul applied to Buildings for a permit to build a one-story rooftop addition to 315 East 10th Street. At Landmarks’ hearing, residents and preservationists urged Landmarks to designate the district before Shaoul obtained the permit for the rooftop addition. Representatives of local Council Member Rosie Mendez, Manhattan Borough President Scott M. Stringer, State Senator Daniel Squadron, and Assembly Member Brian Kavanagh reiterated the community’s concerns. George Diggle, the owner of 307 East 10th Street, testified that it would be a tragedy to allow the proposed addition at 315 East 10th Street. The Lower East Side Preservation Initiative’s Richard Moses claimed that the block was under a sustained assault from real estate developers. Following public testimony, Chair Robert B. Tierney stated that Landmarks would immediately vote on the district. Tierney explained that Landmarks was expediting the designation process because one of the buildings “was under threat with a potentially unsympathetic” addition. Tierney strongly recommended approval of the district, and the other commissioners agreed. Despite the expedited process, Shaoul obtained the permit to build an addition prior to the designation vote. Buildings must wait 40 days before approving professionally certified permit applications for a building calendared for designation by Landmarks. The time period lapsed on January 9, 2012, eight days before Landmarks acted. Landmarks’ spokesperson Lisi de Bourbon stated that Landmarks expedited the designation process after receiving notice from Buildings about Shaoul’s permit application. According to de Bourbon, Landmarks moved as quickly as possible to schedule the hearing and vote considering the amount of research needed and the public notice requirements of the landmarks law. LPC: East 10th Street Historic District, Manhattan (LP-2492) (Jan. 17, 2012).